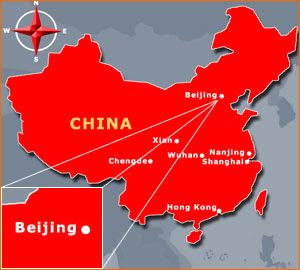 This is Beijing? The Summer Olympic 2008 city? 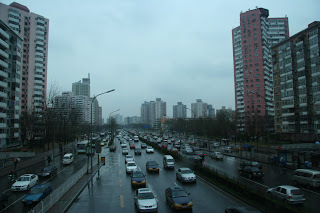 Beijing is a depressing city. Right as I got out of the gates of the railway station at midnight, I raced with the thousands of other travelers to the street to catch a cab. At every turn I was harassed with solicitors. With a frown and a beaten down posture sadly holding a pamphlet as if they were bagging for change or showing a picture of their lost child. Instead itâ€™s for a hotel or another service of some sort. It looked more like a car pileup then a taxi line. Finally I got to the cab area after brushing off eight or nine solicitors, but it is the same here. I can see a sea of cabs inches apart fighting for passengers. It looked more like a car pileup than a taxi line. Even then hustlers approach me and try to negotiate a fixed rate double or triple the actual cost of the trip. There is 48,000 sqm of exhibition space and over 1,100 exhibitors from 14 counties and regions. 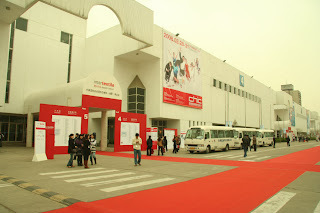 I am here for the Intertextile Beijing Apparel Fabrics Fair March 27 – 29, 2008. It is Chinaâ€™s bi-annual gathering of fabric producers showcasing their latest technology and development. There is 48,000 sqm of exhibition space and over 1,100 exhibitors from 14 counties and regions. This is held in the old China International Exhibition Centre (CIEC). As you expected the CIEC consisted of large rectangular windowless buildings that looks like movie studios but the white pristine texture added a sense of cleanliness. As I strolled around the fair I noticed a large exhibitor with bamboo stalk design. As I spoke to the agent I realized they mainly make their products out of nylon with only one bamboo nylon fabric. Bamboo is used very often for dÃ©cor and design in the Chinese culture. I noticed this especially for restaurants. As I asked around I noticed not many Chinese fabric producers know of bamboo and even the information agent was perplexed about the fabric and couldnâ€™t direct me to the any particular area. I did however meet a couple of suppliers that had a small offering of bamboo fabric. …the most innovative use of bamboo is from a silk fabric company. However the most innovative use of bamboo is from a silk fabric company. They developed a very nice silk bamboo composition fabric. I always liked the delicacy of silk but was worrisome of its fragility. With the bamboo it adds durability and softness while maintaining the sheen and airiness of silk. I can already think of a product this would be perfect for!